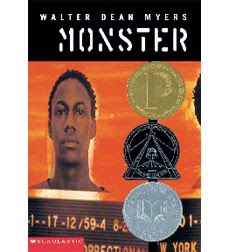 My Facebook wall lit up today with the news that Walter Dean Myers died yesterday. He certainly deserves to have his passing, and everything else about him, noted. I was surprised to hear the news. Though I was aware he had adult children, I always thought of him as a youngish man, probably because he turned out highly regarded work on a regular basis. He was at the top of his game. I've only read one of his books, Monster. It was an incredible piece of work. The subtlety of what was going on with that young man was amazing. And I was very taken with the book's format. It was a definite influence on Saving the Planet & Stuff's structure, though I didn't get anywhere near as into it as Myers did. Certainly I wish he could have stayed at the top of his game for a while longer. But since that couldn't be, how wonderful that he could leave such a large body of work. His next book, On a Clear Day, will be published this fall. Then he has Juba! coming out next spring.